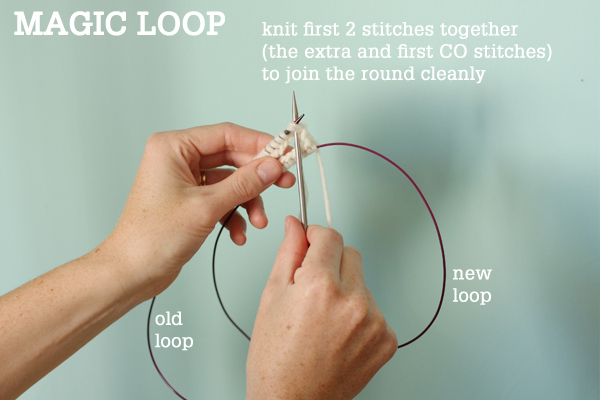 There are several ways to knit in the round. 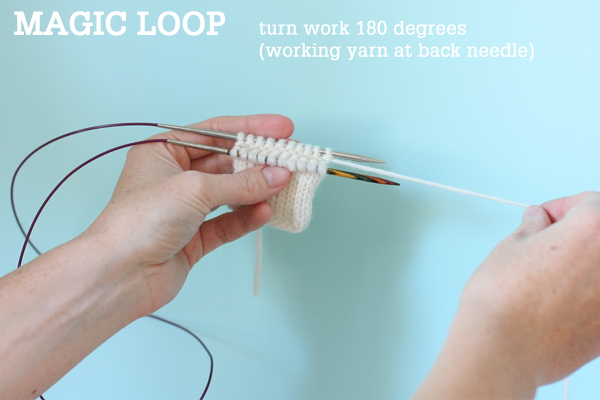 For tubes that are 16″ around or larger, you can use a circular needle [tutorial here] – they come in several lengths (there are also really tiny little 9″ circulars that work for socks and mittens, but they are a less commonly used). 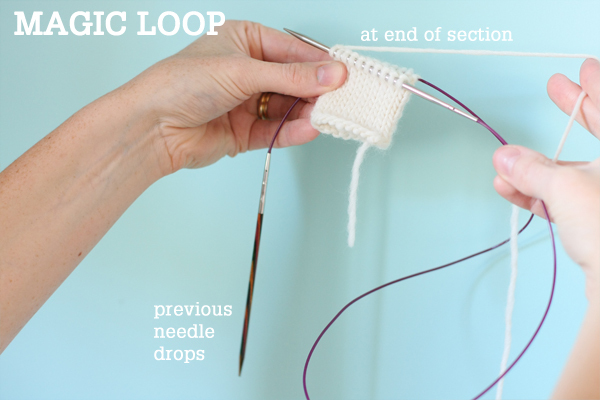 For knitting small diameter tubes (socks, sleeves, and the decrease sections at the top of hats), you need to use another technique: either double pointed needles (DPNs) [tutorial here], or a technique called ‘Magic Loop’ which employs a single long circular needle. 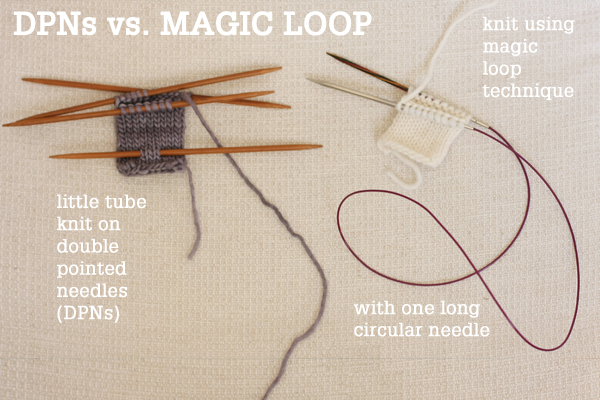 Here at Tin Can Knits, Alexa prefers DPNs and Emily prefers the Magic Loop technique. The results are the same, so the choice is up to you, and you should use the technique that you prefer, although it is useful to know both! 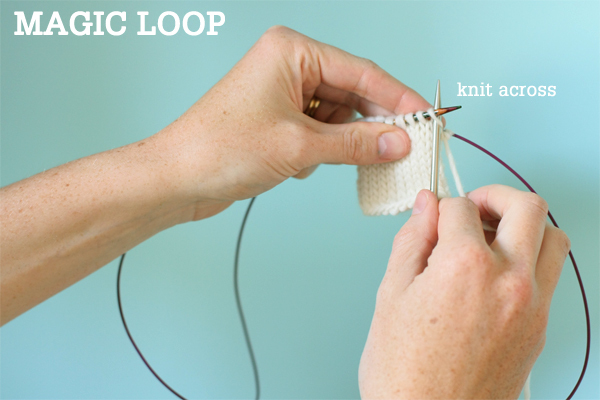 We have a tutorial here describing the process for knitting in the round on double pointed needles. This tutorial is dedicated to Magic Loop. 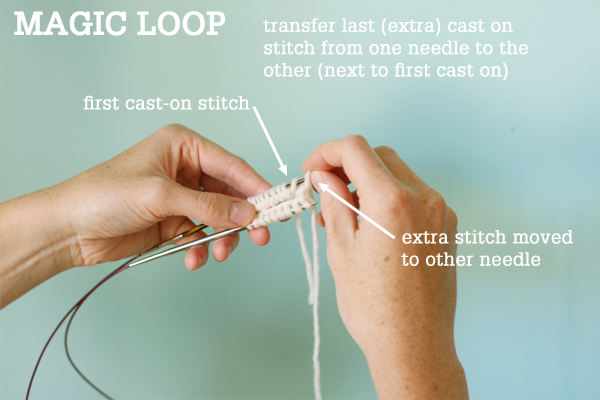 Using a 32″ / 80cm or longer circular needle, cast on the required number of stitches, plus one extra stitch. For this example, I CO 21 sts. I have also used two different kinds of needle tips (metal and wood) to make the process a bit more clear. 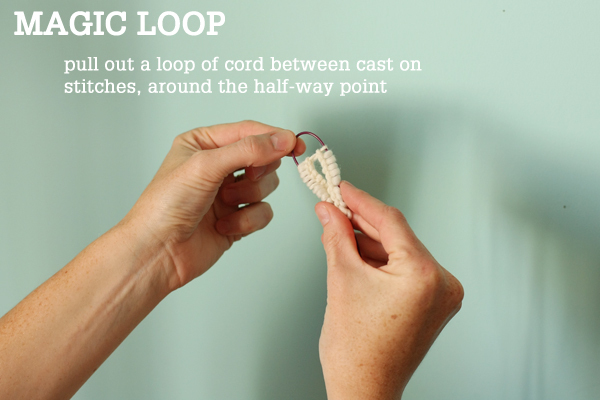 Folding the cable in half at approximately the half-way point of your cast-on stitches, pull out a loop of cable. This means half the stitches are on one part of the cable, then there’s a loop, and half the stitches are on the other part of the cable. Now slide the stitches to the needle points, so the two needles are together, and the needle points next to one another. Make sure that the cast on ‘edge’ is not twisted. Transfer the last stitch you cast on (the extra stitch), using your fingers, from the needle it is on to the other needle. Now you are ready to begin! The needle tip which had the last cast on stitch on it, and the working yarn, is the needle you will knit with (in my case the metal needle). 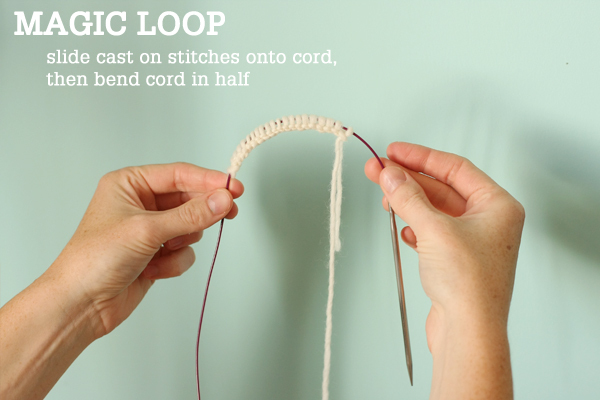 Pull it out, until there is a 8″ loop of cord, then use it to knit the first 2 stitches of the round together (the extra stitch and the first cast-on stitch). This little trick is not essential, but it makes for a nice clean join at the cast-on edge. This is the first stitch of the round. Next knit across the rest of the stitches on the wooden needle. Once you are at the end of the needle, half the stitches are on the metal needle, and the wooden needle is free, flopping about. STEP 1 ::: To prepare to knit the next set of stitches, pull the cord on the loop, until all stitches are on the needle tips again, half on the metal needle (you just knit those) and the others on the wooden needle (these are the next stitches to knit). There is a single big loop at the other end. STEP 3 ::: Pull out the back needle (metal needle in my case). STEP 5 ::: knit across the stitches on the front (wooden) needle (after knitting the first stitch of a section, give it a nice tight tug to ensure there isn’t a big gap between it and the previous stitch). Then you are in the same situation as you were – you have half the stitches on the metal needle, and the wooden needle is free, flopping about. Repeat steps 1-5, and a little tube of knit fabric will form! 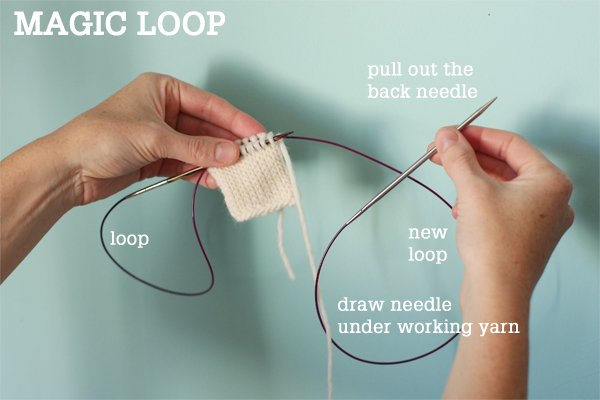 As you will notice, you are ALWAYS knitting using the same needle tip in your right hand, the other needle tip always acts as the left-hand needle. LETS REVIEW THE PROCESS AGAIN, with a few more rows on the needles. With practice, it will become simple, clear and intuitive for you. 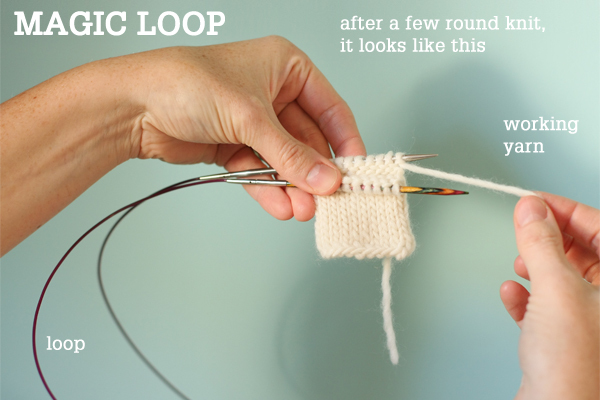 In my opinion, the magic loop technique is simple and elegant, and it avoids the problems of dropping stitches off the ends of double pointed needles. Markers don’t really work when placed at the start or end of needles (same as with DPNs), but you can place them in between, and use the end of the section, or the ‘loop’ as a marker. 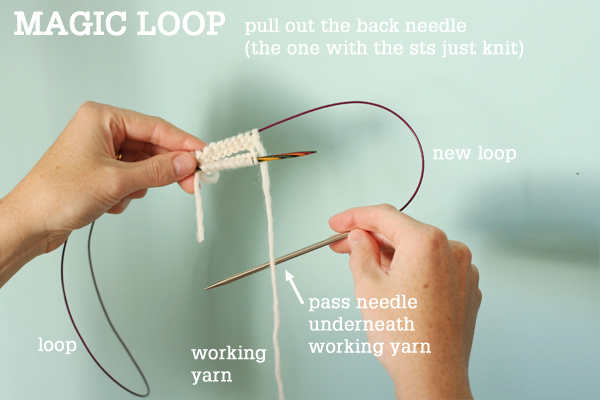 You can work any number of stitches using this technique, although when I have a large number of stitches, I find it more convenient and fast to knit using a circular needle of the correct size, rather than an excessively long one! Like our in-depth tutorials? To stay ‘in the loop’ get our email updates! Hi! Thanks for the tutorial! I’m about to try magic loop and I’m interested in knowing the best cable for this. Do you have a recommendation? Thank you so much! Hi Camille – I like a 40″ cord but some knitters prefer smaller (like a 32″) and some prefer even longer (like a 47″ or so). How can I print the magic loop instructions? Perfect tutorial, gave me exactly what I needed. I’m an experienced knitter & ‘had to read it thru twice. I can understand why some might read it and then go looking for a video tutorial, lol. However, that’s cuz it’s more complicated to (first) just read than it, my best advice is — To DO IT _while_ reading about how to do it. Thank you for the first clear explanation of magic loop I found! And I looked for a lot :-) My question is, how do you change needle sizes in the middle of a pattern? I’d like to use one size for the brim of a hat and go up a size for the body. Is this possible? Thanks! Absolutely! 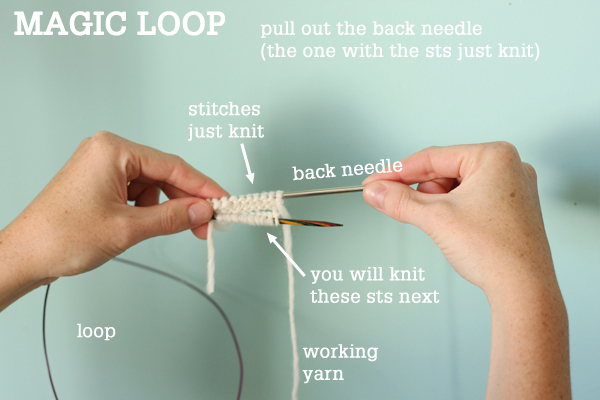 It works exactly the same as any other needle change, you have your smaller needle in your left hand and your larger needle in your right and you just knit your sts onto the larger needle, pulling out your loop of yarn at the same spot as the smaller one. I am so confused some instructions say to pull the top needle out so you can knit with it and some say to pull the bottom needle out to knit with it, this is for knitting magic loop socks toe up. Is there a tutorial on the right way to do magic loop? Hi Carolyn – it depends which way you are looking at your knitting, but you are going to pull the needle with the working yarn on it out and make sure your sts to work next are on the other needle. Thank you for this very clear explanation of this technique. I am relatively new to circular needles but since knitting a few projects I am totally hooked. In the past, I have found DPN’s to be awkward and could never get through a project without dropping stitches or using cumbersome end stoppers. The circular needles solve this problem. 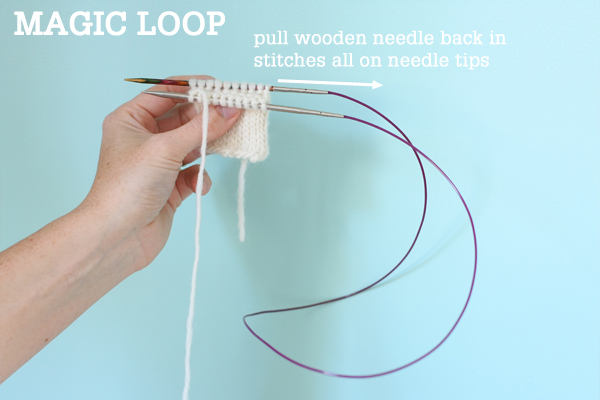 The Magic loop method allows for knitting smaller tubular projects which would be 10x the work involved with other needles. Hello, I can’t get this to work! I use the long tail cast on, and when I transfer the extra stitch, it just gets looser and looser and then it undoes. Any ideas what I’m doing wrong? Thank you so much. I hate circular needles and have been avoiding any patterns (no matter how beautiful ) that uses them. Can’t wait to use your technique! I also am self taught with no friends who knit! I am so frustrated that I cannot get this! Firstly, what cast on method do you use? With mine, my tail and working yarns are at opposite ends of the needle. Secondly , because the first stitch of the Maize mittens is a purl, I assume you purl the extra cast on stitch and the first purl stitch together as a purl? Determined to persevere! 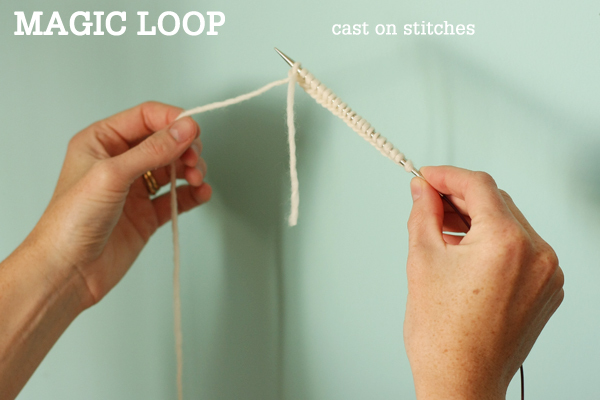 Hi Alison – It won’t really matter which cast on you use, if the Magic loop is giving you trouble I would recommend trying it out on something that has already been cast on and worked for a bit, like the crown of a hat. It all seems much clearer that way, and then when you cast on for Magic Loop I think it iwll make more sense. You have that right, you are going to cast on an extra stitch and purl it together with the first st for the Maize mittens. A little tricky but I’m working on it. I am a DPN person usually but want to learn TAAT socks so thought I’d try it. I think I forgot to turn work a couple times. Also, I’m seeing a gap at the join and am not sure how to fix that? I had the same problem, make sure the stitch that joins each end when starting the other half of magic loop is kept tensioned tp prevent extra yarn being pulled into the wip. Hi Patricia – I’m afraid the answer for me was just practice. I try to give the first stitch a little extra tug, but it’s important not to make it too snug if it’s on the cord rather than the needle. Thank you so much! This is super detailed and I love the photos for each step!!! What a wonderfully clear explanation! My daughter is expecting her first baby and I have loads of baby stuff I want to knit and only long length circular needles, so now I can knit to my heart’s content and I haven’t got to buy lots of new needles. I was struggling to master the magic loop but thanks to you it is now so much easier. The ChiaoGoo Red Lace Circular Needles are all getting high marks from reviewers saying how perfect they are for Magic Loop knitting. Including that they don’t kink or curl on their own, but Magic Loops pull wondefully and easily. They’re a slightly higher class of needles, very smooth & well made, & so somewhat more money, alrhough not at all exorbitant. 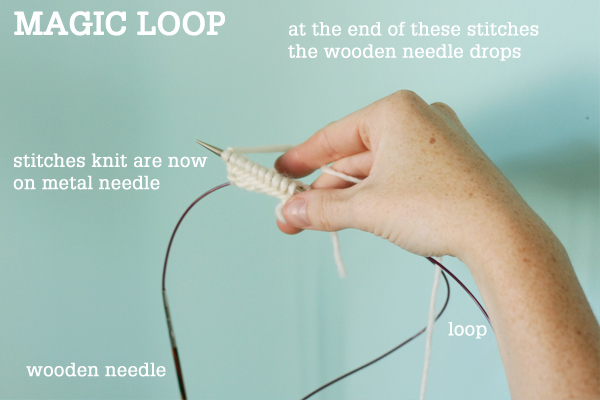 I just ordered two pair – cuz they sent me to this page here, where I’ve finally figured out Magic Loop, and now can use their needles! Lol. Wanted to knit some fingerless mittens. Was going to use double pointed needles but came across the magic loop method and decided to give it a go. Always keen to learn a new technique. Tried a website that demoed it and got totally lost. By then I was determined so searched again and found tincanknits. It took some practice but after an hour I nailed it and now I love it. Thank you so much for your very detailed step by step method and great photos. So happy with the result. So simply explained! Thank you !!! How do I determine the size of an adult man hand size for mittens to determine how many stitches I need.? Hi , am I right in thinking both mittens are the same with no left or right hand ? 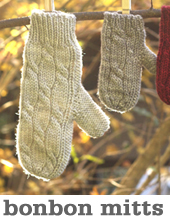 That comment was referring to The World’s Simplest Mittens, which don’t have any patterning. Thank you for showing how to close up the gap with the extra cast on. 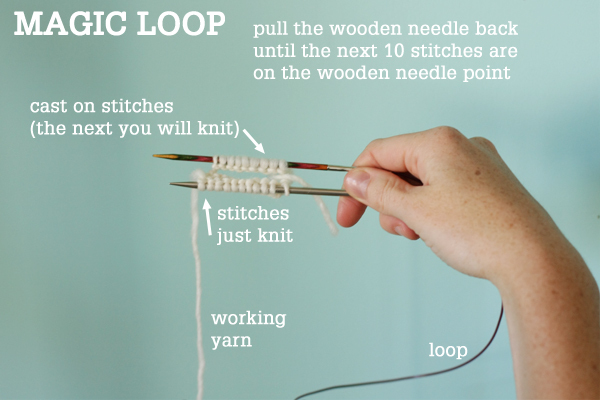 Your tutorial is the only one for magic loop knitting that I could find. I could not figure out how to do it and tried without success. Can you teach me in person face to face! I want to get this!!!! Hi Ann – we aren’t teaching at the moment, but perhaps there is a yarn shop near you? I am really enjoying your site. Do you recommend the magic loop method with pin hole cast on for making the Vivid squares? I’ve been playing with it and it’s probably my inexperience that is making this challenging, just wanted to check! Thanks. Hi Kathy – on this issue we are split, I prefer the DPN’s with so few stitches, but Emily uses magic loop. Perfect! i looked through so many videos and instructions, yours were the best! Thank you for the wonderful instructions. I am working the flax pattern and am working the first of the sleeves using the magic loop (picking up at the armhole). I tried three times following the tutorial but I always end up starting out knitting backwards (working counterclockwise around the armhole with the front of my knitting facing INTO the sleeve. Any tips? I think you may be forgetting to join for working in the round? Thanks for trying but I finally realized what I was doing wrong…I transferred the live stitches onto my circular needle backwards. Just in case anyone else has this issue! Love your patterns and tutorials! Thank you. so easy to follow I was quite nervous about using this method but not now! Although I have managed to work it inside out! I think I may need a little more practice! I’ve been knitting using the magic loop method, but my right side is on the inside when I’m working. I then just turn my finished work inside out. It’s worked on hats, cowls, and mittens but I’ve never knit a sweater before. I want to make your Flax sweater my first one. Do you think my method will be a problem? 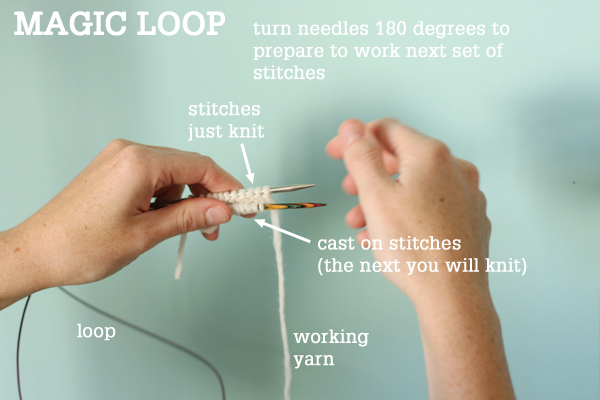 My working needle is in the back of my work… I can re-learn the method to make your sweater, it’s worth it. Thoughts??? Nope, magic loop is just fine!! It’s hard to get a small enough circular, you would need something like a 12″ (that’s tip to tip), I would typically work magic loop on a cord 40″ or longer. Magic loop..I have 10 stitches on each needle but they are the sides of the sock instead of the sole & instep.. I need to move them to have 10 on top (instep)& 10 on bottom(sole) to do the Kitchener stitch.. How do I do that? 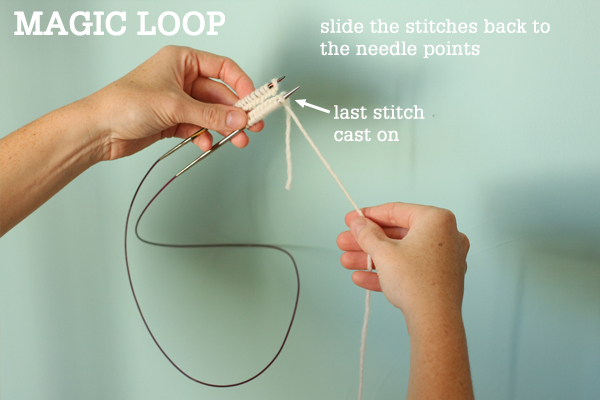 You can slip stitches around the needles so that you get them into the correct position, and pull out the ‘loop’ in a different location. You may want to knit a few stitches so that your last stitch knit is at the end of either the sole or instep section of the sock, and you can kitchener using the yarn tail, starting at one end. 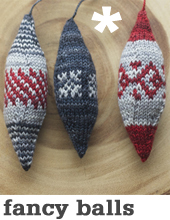 You may want to check out our Rye sock pattern – it is our free beginner sock pattern. Good Luck! I am going to start knitting the sleeves for your Antler sweater pattern. I was going to use the magic loop method for joining in the round. The pattern says after knitting rib with smaller needles you need to switch to larger needles. How can this be done using the magic loop method? ?How do you get the stiches from one needle size to the next needle size? Maybe I have to use double pointed needles??? 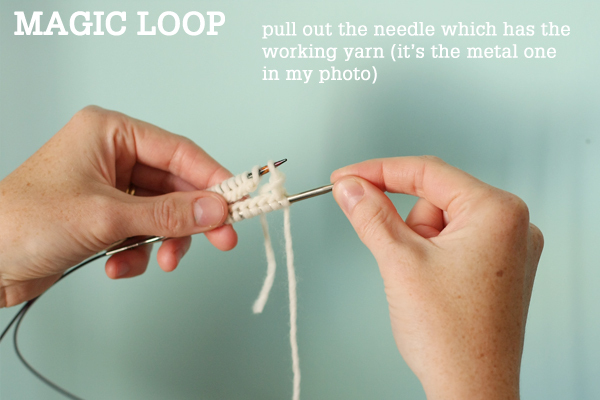 Can you explain how to do a yarn over at the end of a “magic loop ” row? I’m struggling to know where to place my yarn to start the new row following the yarn over at the end of the previous row. Thanks! You may want to try moving where your loop comes out. Then you won’t have it as you make the change. Thank you for the very clear instructions of magic loop. I have only one question, what do you do with the extra stitch besides slip it to the other needle? If you were doing a pattern,wouldn’t this extra stitch be extra? I ordered HiyaHiya both the large and small bamboo interchangeable circular sets. They come with various cord lengths. Could one of these sets be used to do the magic loop method for a hat, I’m trying to avoid buying more needles but will if needed. Hi Cindy- you bet! 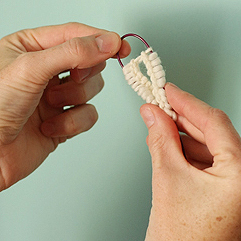 Just swap in a longer cord and you can magic loop the top! Thank you for your excellent tutorial on magic loop. Have wanted to try it but until now found it too confusing. Your photos of each step are brilliant. I didn’t have correct dpns to start a new jumper pattern sleeve so followed your tutorial and now have a new knitting skill. Thanks again. hi i would like to know when you knit socks, how to make sure that the leg opening is on the opposite side when you knit the second sock( im knitting slipper socks) i am a beginner and not sure what to do. i suppose it means a right and left foot sock? Hi Wilna – for socks we usually just knit two the same. If you are knitting from a pattern with definite left and right feet it should have instructions. Knitting is stretchy and flexible (unlike shoes) so it shouldn’t matter which is which. Thank you for this excellent tutorial! It is so descriptive and the photos are incredibly clear and easy to understand. I am so excited to try the extra cast on stitch trick that you outlined also. A couple questions for you……I am ready to start the decrease for the toe, following a “wedge toe” pattern. Im not sure if I should be dividing the stitches differently than when I’m knitting the foot section. Should I be placing markers so that I know when and where the K2tog etc should be?? Also I’ve now knit 3 pairs with the basic sts and would now like to try a sock with a pattern. Could you recommend a “simple” pattern to try for my 1st patterned sock. Thanks so much…….love your postings!!! 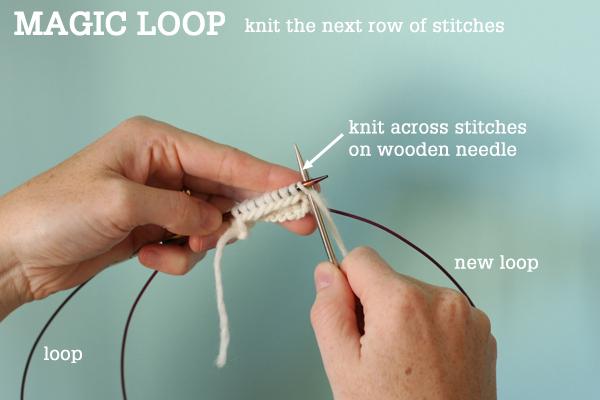 If I was knitting toe decreases using magic loop, I’d put the top-of-foot stitches on one needle, and then bottom-of-foot stitches on the other needle, and loop between them. Then you’d work a decrease at the start and end of each needle to form a wedge toe (like [k1, ssk, knit to last 3 sts on needle, k2tog, k1] twice. I’d recommend the Monkey Socks by Cookie A: http://knitty.com/ISSUEwinter06/PATTmonkey.html they were my first socks, and I love the pattern. Thank you for taking the time to explain this!!!! I am working on a project trying to use magic loop but I was doing it wrong. . . Can’t wait to try it right, I think I will be happier w. The results! 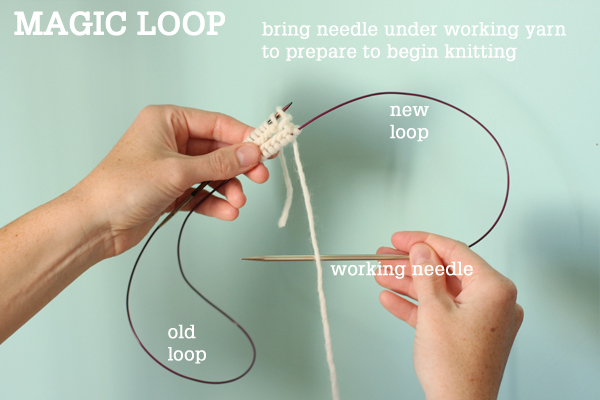 don:t understand how this is different than using two circular needles ,dropping the first needle when end of first group of stitches.and letting it hang loose picking up the second circular and knitting across that needle. 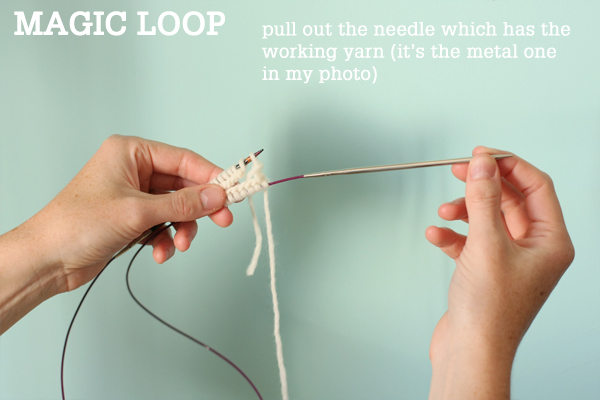 i used the loop method but only use one needle. why the two needles? I’m not sure I understand the question, we are only using one needle. It is a long circular needle. While I am an experienced knitter, I have never used this method but found myself with a project I wanted to do and without the correct needles so I decided to try it. I looked at a number of pages and found your directions the easiest to understand. 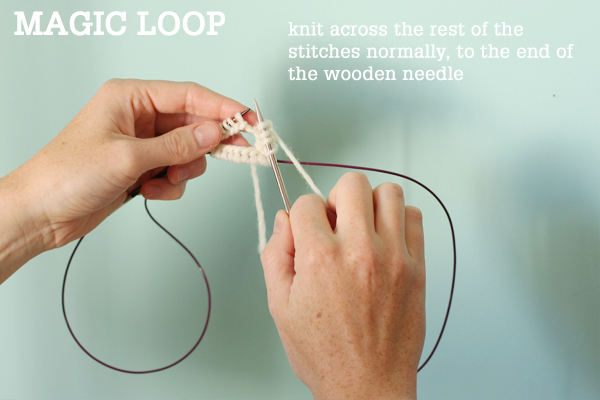 Once I got going and was familiar with the technique, I tried randomly pulling my loop as I continued to knit – always keeping stitches on my needles. I was able to knit faster and my stitches were more even as this eliminated the joining in the original technique. Worked great!!! Thanks Ginnie! We aim to please! Now I get it!!! Thank you so much for this. I understand the basic premise of magic loop, but I have not found one tutorial that explains how I will know I have completed a full row. Is there an easy way to tell? I have even tried a marker, but somehow it didn’t work. I guess I could just count double. Thanks for any advice! Placing a marker definitely helps! Counting double will work too. I’m interested in trying this technique but wonder whether laddering will be more of a problem. When making socks with dpn I continuously change the point at which I go from one needle to the next so I don’t have to deal with that tendency for the changing point to create a vertical line in the sock. Is this any harder to do with the magic loop? Or is there a different way to prevent the possibility of laddering? I think it’s about the same, you can still change where the join is on a regular basis to avoid ladders with Magic Loop. It’s actually pretty easy to eliminate laddering without having to keep changing the transition point with this method. When you pull out the back needle when you’re at your changing point, the last stitch you made is now on the loop, which is much thinner than the knitting needles. If you pull on the working yarn, that last stitch is pulled tight on the loop and becomes really small, and the usual “stretching,” which would normally lead to laddering, causes it to become the same as all the other stitches. I hope that makes sense. Thanks, Agustin! And thanks for the easy to follow instructions for the magic loop. Hello! I used this tutorial to learn Magic Loop. So easy! And I’ve only been knitting for a few months! If a newbie can figure it out, anyone can! I gave you a shout out on my blog, so people know where I learned it. Thank you so much for the very clear instructions! Happy knitting! Hi Sandy – we don’t have a tutorial specifically on how to pick up along the gusset when using magic loop. But the process is exactly the same as when using DPNS (except you pick up using your circular needle). 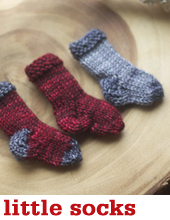 Check out our tutorial on sock knitting here. When needing to pick up sts for the heel, I use an interchangeable tip, dpn or other circ. Then slide the picked up stitches to my working circ. It does require additional tools, but much easier than trying to pick up with the working circ in magic loop mode. Oh that’s one way to do it, but I’ve always just used the working end of the magic loop circular, and never had an issue with it. 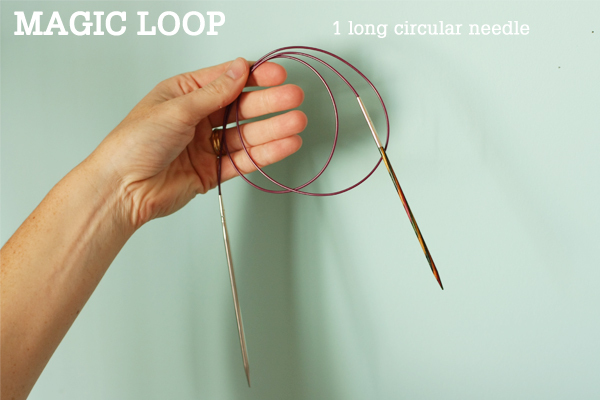 But I do tend to use quite long circulars for magic loop (40″ often). This is BY FAR the most helpful magic loop explanation I have seen. However, I have a question. When I knit in the magic loop, I end up with yarn slipped over the cable, at the end of the first half of a row. It looks as if it is the part joining the round. When I simply slip the needle out so that it is no longer going over, I end up with small holes in my knitting. When I knit it (as if it were a stitch) I end up adding a stitch to every row. If I attempt to ignore it, it usually slips off anyway in the process of me turning my work 180 degrees. Do you have any idea what this is? Will the extra stitch help this? In addition, when do you stop knitting the extra stitch? How do you do that without dropping it? Thank you so much, I’m sorry, it looks as if I might have actually had many questions! 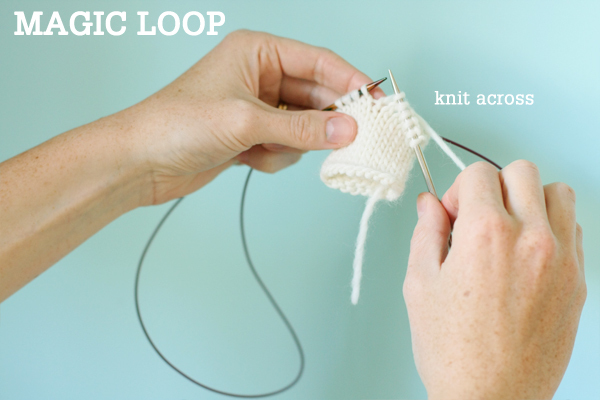 Do you have a tutorial on knitting 2 items (socks or sleeves) at once with either the magic loop or 2 circulars? I’m getting mixed up with casting on and keeping track of the circulars and where to start when I have to put my work down and come back later!! Thank you so much! I have feared using circular needles until now, because I found your tutorial!